Architect George Willis Lawton (1864-1928) was born in Wisconsin on December 29, 1864. He moved to Seattle around 1886 and initially worked as a draftsman for the architectural firm of Saunders & Houghton. By 1889, he emerged as a partner with Charles Saunders. Together Saunders & Lawton designed a wide range of projects, including numerous apartments and hotels such as the Lincoln Apartment Hotel; the San Marco (1905) and Summit Apartments (1910) both in Seattle; and the Shelton Hotel (1908) in Shelton. They also designed some of the first structures at the Veterans Home in Retsil (1908), sveral buildings at Northerns State Hospital in Sedro Woolley, and the public Library (1914) in Sedro Woolley. Another specialty was warehouse structures, and they found a fertile market for their designs with the growth and development of the Pioneer Square area as a distribution center. Some of their buildings in the area include the Norton Building (1904); the Mottman Building (1906); the Goldsmith Building (1907); and the Provident Building (1910) building. They adeptly used a wide range of revival styles, including Romanesque, Classical, Tudor and Colonial modes. One of their most noted works was the Forestry Building (1908-09) at the Alaska-Yukon-Pacific Exposition, a classical design executed in raw logs. For unknown reasons, the partnership was dissolved in 1914 and Lawton worked independently for another eight years. Projects included the Veteran's Home Hospital in Retsil (1919); Women's Dorm at WA State Veterans Home (1917) in Port Orchard; and the King County Juvenile Home (1915) in Seattle. In 1922 he formed a new partnership with the younger Herman A. Moldenhour (1880-1976). 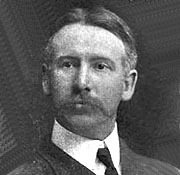 Moldenhour, also from the midwest, had been an office boy for the Saunders & Lawton firm. Together the firm specialized in large office and apartment buildings. Projects include St. Demetrois Church (1921); the Fifth Avenue Court (1922); Hawthorne Square Apartments (1923); The Bigelow Building (1923); the Olive Crest Apartments (1924); the Olive Way Improvement Co. Building (1924); the Republic Building (1927-28); and the Liggett Building (1927). The partnership ended prematurely when Lawton’s died unexpectantly on March 28, 1928 at the age of 63. Moldenhour continued with an independent practice. "Notice to Contractors" Morning Olympian, July 4, 1907. "L.J. Irwin, Head of Reformatory" Olympia Record, October 7, 1907. "Landscape Artist for Veteran's Home" Olympia Record, December 21, 1907. "Fair Commission Completes Session" Olympia Record, March 14, 1908. "Saunders & Lawton Take Masonic Plum" Seattle Daily Times, March 27, 1912. "Call fo Bids" Bellingham Herald, May 11, 1914. The American Architect - Vol CXI, No. 2166 - June 27, 1917. "New Buildings To Start Soon" Olympia Record, March 24, 1919. "To Start New Building" Seattle Daily Times, March 17, 1923. Advertsisment "Lawton & Moldenhour" Seattle Daily Times, August 30, 1923. "George W. Lawton, Architect, is Dead" Seattle Daily Times, March 28, 1928. Obit: "Mrs. George W. Lawton" Seattle Daily Times, June 28, 1937.